Breakfast in my household is a harried mess, no matter how well I try to keep everything planned, in order and tidy. It’s not. Breakfast in our home is a mess of half-done dishes from the night before, school work on the table, milk mugs, tea mugs. Yet, one of the things I try to do each morning is to serve my family something warm, something nourishing and satisfying. My favorite meal is something simple, savory and filling: Avocado, Turkey and Pepper Jack Breakfast Sandwiches. They are absolutely delicious, and blessedly easy to make, using only one dish and coming together in under ten minutes. And my husband and son? They love when I make these breakfast sandwiches. Easily adapted to what you may have on hand and lurking in your fridge, my breakfast sandwiches typically require only a handful of ingredients: natural deli meats and cheese, whole-grain sourdough bread, pasture-raised eggs and avocado. I’ve also been known to slip fresh herbs, tomatoes and sturdy greens into the sandwiches from time to time, too. 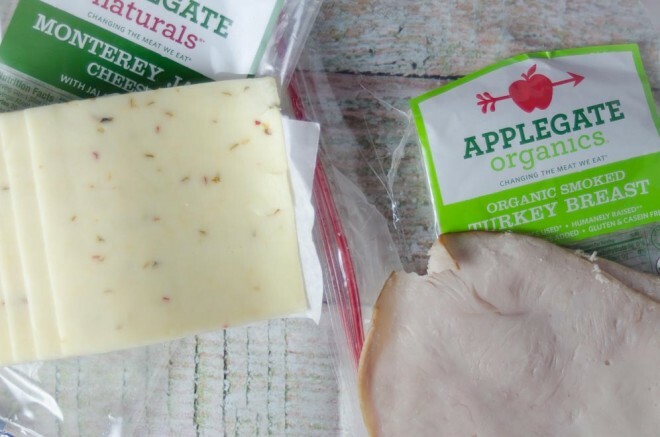 I work with Applegate on their advisory board, which is positively thrilling to my little boy who adores their uncured bacon, grassfed hot dogs, and uncured pepperoni. Many deli meats are positively loaded with additives and they come from animals raised under far from optimal conditions, which is why I always tended to favor Applegate’s products as they’ve long been advocates for humane treatment of livestock, visiting supplying farms to ensure compliance. They similarly do not support non-therapeutic use of antibiotics in livestock. Essentially, it’s the good stuff: uncured deli meat without lots of additives from animals raised humanely, without antibiotics or hormones. And their organic line? The animals are fed a supplementary certified organic, non-GMO feed. And, again, you can find their products at health food stores and many supermarkets around the country making them easy to access. Thick, creamy slices of avocado peek out beneath the slices of natural deli meat in this sandwich. Each month we receive a box of heirloom avocados shipped to our door. I toss them into salads and smoothies, and tuck them into sandwiches like these which not only contributes a lovely richness to the meal, but also makes them powerfully satisfying. Wholesome fats, like those found in avocado, have a staying power to them. Avocado is also rich in B vitamins, vitamin K1, and vitamin E.
To prepare these breakfast sandwiches, I first cut a hole into the center of each slice of bread and drop an egg into it. It’s my son’s favorite part of making the sandwiches. I favor pasture-raised eggs that we pick up from an area farm once a week. Pasture-raised eggs, by contrast to eggs from hens raised in confinement, offer a richer array of nourishment including 2/3 more vitamin A, 3 times more vitamin E, and 7 times more beta carotene. They are also a rich source of biotin which supports healthy skin, hair and nails as well as choline. Quick, filling, easy and fun, these open-faced breakfast sandwiches are one of my family's favorite meals. I favor using pepper jack cheese and smoked turkey breast, but ham and swiss makes a fine combination, too. Take a biscuit cutter or a sharp knife and cut a hole in the center of each slice of bread. Melt the butter in a large cast iron skillet over medium heat. Working one or two at a time so as not to crowd the skillet, place the bread in the hot fat, and crack an egg open into the hole cut into the center of each slice. Cook the egg and bread together in the hot fat for 2 to 3 minutes or until the white is set, then flip it over. 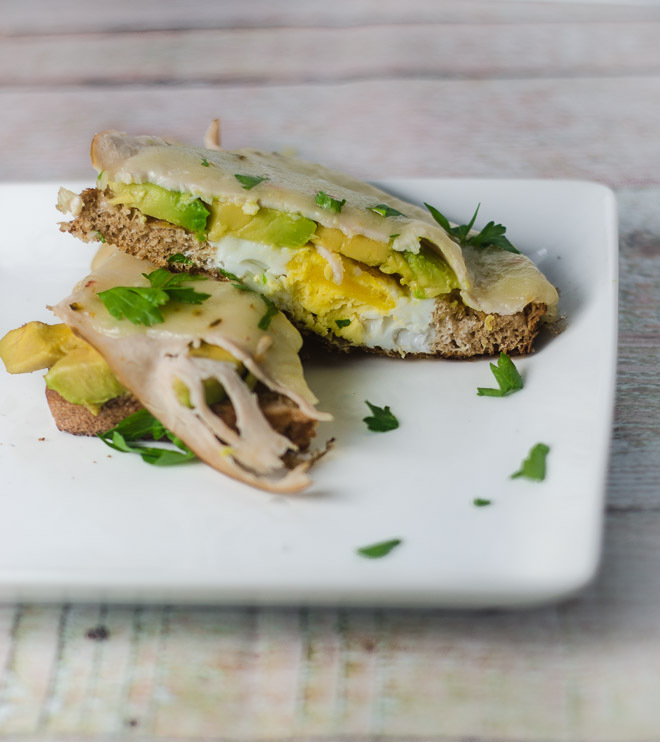 Top each slice of bread and egg with avocado, 2 slices of turkey and 1 slice of cheese. Cover the skillet with a tight-fitting lid, continuing to cook for 2 to 3 minutes or until the cheese melts and the yolk is done to your liking. Sprinkle with parsley, or other herbs of your choice, and serve warm. Looooove a good breakfast sandwich. I made big homemade pretzels over the weekend (http://girlnamedallyn.wordpress.com/2014/06/03/soft-pretzels/) and we’ve been using them for our breakfast sandwiches this week. Tastes kind of like a Burger King croissan’wich, only better and about a million times healthier. I might have to go grab an avocado to add to them though. Breakfast sandwiches are the best! I have never cut a hole in the middle for the egg, nor used sliced turkey, but avocado and pepper jack are two of my favorites. Thanks for the info on the Applegate meats. I am not thrilled about the quality of the most sandwich meats. Thanks for the great recipe! Your photos are beautiful! We call these Egg in the Hole sandwiches! My girls love them for any meal of the day, and that they can help make just adds to the goodness 🙂 Love the addition of avocado. Definitely going to try that. Thanks for your endorsement on Applegate Organics! I don’t mean to be cynical, but it is sometimes difficult to trust product claims and labeling…the fact that someone like you, whom I trust and have learned about food issues, thinks this is s good line is a relief to me! I, too, have busy household, and one on my kids has Type 1 diabetes, so a good breakfast with protein and healthy fat is a must! Will add this one to my list! oops- typos and poor grammar…sorry! Going to make that right now! Do you think I could make this from a savoury pancake – buckwheat for example as I cannot eat gluten? I made this for my girls and myself this morning and called it peekaboo toast! The girls wanted their avocado on the side with a squeeze of lime and sprinkle of pink salt. I had mine with the avocado right on top with chopped up dandelion greens. Delicious! Can you tell me where you get the box of heirloom avocadoes shipped from? Thanks! I was inspired by this recipe and used some stuff I had one hand – crostini with homemade guacamole and a sunny side up egg on top with melted pepperjack cheese. Thank you! Have made “Egg in the Hole” for many years, but never thought of topping it with avocado and cheese! I love savory breakfasts, and I need to try this!! Thanks for posting! So excited to try this!! Where can one obtain good quality sourdough bread? Is there a brand you recommend?